JUST OVER a century ago, a young actor named Douglas Fairbanks made his mark in a Broadway play called A Case of Frenzied Finance. Fairbanks played an ambitious bellboy who wants to make a killing in the stock market. The plot seems especially apropos considering our recent experiment with speculative bubbles. Indeed, Fairbanks' essential style could be summed up by that infamous financial state of mind known as "irrational exuberance." Fairbanks' acting was as much athletic as declamatory—Why run when you can jump? summed up his style. He caught the eye of a cameraman in 1914, jumping blithely over a park bench. A movie deal quickly followed, and starting in 1915, age 32, he embarked on a remarkable career that made him, along with Charlie Chaplin and Mary Pickford, one of a new breed of celluloid megastars. In 15 brief years, he appeared in dozens of popular comedies and produced increasingly elaborate spectacles, contributing as writer, producer, stuntman and star. These days, Fairbanks' fame seems as fabled and distant as the settings of his biggest films: The Thief of Bagdad and Robin Hood. In Douglas Fairbanks, a generous new biography, Jeffrey Vance writes that he "is dangerously close to being forgotten at the dawn of the 21st century." Vance's book and a wonderful five-disc, 11-film DVD set from Flicker Alley redress the oversight. Fairbanks' appeal in the pre–World War I era lay in his unconquerable can-do spirit. His comic characters faced disasters with aplomb; any obstacle could be surmounted with a single, springy bound. Fairbanks was, as Vance notes, the screen version of Teddy Roosevelt: bluff, buffed and ready for action, "filled with optimism, ebullience and adventure." A superb physical specimen, Fairbanks knew how to make the toughest stunt look effortless. He pops from the ground to a high ledge with barely a bend in his legs; he vaults tables as easily as a man skipping over a curb. His irrepressible grin and imperturbable spirit made him hugely popular. The Flicker Alley collection does a great service in resurrecting some of his feature-length comedies. His Picture in the Papers (1916) displays the basics of Fairbanks' persona. This tribute to "the American love of publicity" finds Fairbanks playing Peter Prindle, the steak-eating heir to a vegetarian empire, which sells everything from predigested prunes to puffed peas. Peter is given the task of getting the family name on the front pages. His strenuous stunts end up thwarted, but Peter's principle is "Never give up!" Even better is 1919's When the Clouds Roll By, about a hapless young man trying to win a girl while beset by a mad doctor's mental suggestions. It features a pre-surrealism dream sequence full of giant costumed foodstuff chasing the hero in slow-motion. By 1920, in the wake of wartime disillusionment, Fairbanks sensed that the public wanted real escapism, and he reinvented himself as a dashing, tongue-in-cheek swashbuckler. 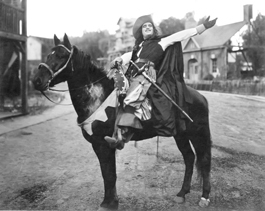 Starting with The Mark of Zorro (1920), Fairbanks forged a genre that would stand Hollywood in good stead, from Errol Flynn to Harrison Ford to a whole raft of comic book superheroes. Fairbanks' cheerful masked avenger maintains a dual identity as harmless Don Diego Vega and Zorro, scourge of oppressors in old California. He even has an underground lair and a faithful butler, a la Batman. The Mark of Zorro, accompanied by Rodney Sauer's stirring score on the Flicker Alley DVD, ages gracefully, full of high spirits and skillfully choreographed derring-do. Seven lavish costume adventures followed, driven by Fairbanks' own restless energy, giving his audiences every bit of himself and the art of silent pictures at their grandest. The Iron Mask (1929) represented Fairbanks "bidding farewell not only to the art form he had pioneered and perfected, but also to the best part of himself and his work." The year before, while visiting one of the new sound stages, Fairbanks said, rather sadly, "The romance of motion picture making ends here." He died in 1939.